Childcare - Supervision is course run by Waterford College of Further Education, Waterford. Childcare - Supervision gives a Course Qualification of Level 6 Certificate / Advanced Certificate, awarded by QQI. For more information about Childcare - Supervision at Waterford College of Further Education, please review the details below. This five module level 6 two year course will be of benefit to those who have a particular interest in professional and social aspects of childcare. The course is designed for students who have already qualified at QQI level 5 and wish to continue their studies. It will suit those who have a good knowledge of childcare and are seeking to progress in their professional development. The Childcare - Supervision course at Waterford College of Further Education is listed in Courses.ie's national courses finder. Entry Requirements QQI Level 5. 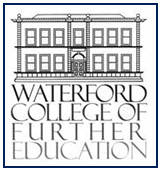 For information about Waterford College of Further Education, please visit our Colleges page on Courses.ie by clicking here.